The tunnels are open from 9:00 am to 5:00 pm, however the ticket counter closes at 4:00 pm. It is also best to go slightly earlier as it gets dark quickly, and you will not be able to see the tunnels. The tunnels were built with simple hand tools in the 1940s as a system to communicate or to hide during the French occupation. The network was renovated and expanded during the Vietnam war by the Viet Cong, who subsequently used them as the base for most attacks on Ho Chi MInh City, including the Tet Offensive in 1968. It is believed that the tunnels housed up to around 10,000 people, who lived most of their life underground, only coming out to fight or to gather supplies. The tunnels are in the Cu Chi district of Ho Chi Minh City, around 50 km northwest of the city centre. They are accessible by taxi and by boat, or alternatively, you can take a half-day guided tour of the tunnels, which will include transport. A taxi ride from the centre of the city will take around 45 minutes, whilst a boat will take around an hour to get there. It is also possible to hire a motorbike or a private car, but it may be more difficult than going in a tour group. See the transport page for more information on renting vehicles in Ho Chi Minh City. 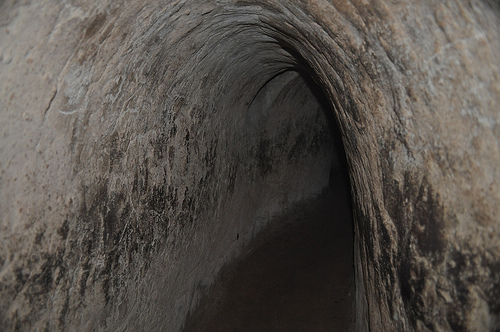 There are two main areas of the tunnels which tourists go to; Ben Dinh and Ben Duoc. The difference? Ben Dinh is more popular with western tourists, with larger, artificially created tunnels, whilst Ben Duoc is less popular in general, with more Vietnamese tourists going there and whilst the tunnels are authentic, they are smalle. So, unless everyone in your group is tiny, I would suggest that Ben Dinh is the place to go, as although the tunnels are widened, chances are that at some point you will have to start crawling with your back pressing against the ceiling. Also, as more tourists visit Ben Dinh, the standards of english there are higher, meaning that communication is easier. At Ben Dinh, there is also a weapons range, where tourists can go and fire live weapons used by both the American and Viet Cong troops at targets; a must for any gun enthusiast. At the gun range, you pay by the bullet; costing between 200,000VND and 400,000VND for 10 bullets, depending on the gun. See tips on paying below. When buying the bullets, use VND as the organisers know that tourists will want to fire the guns, so they put the exchange rate rather low, so if you really want to get the most out of your money, bring VND.